The château of Oiron, the remaining parts of which were built in the 16th and 17th centuries, has always been a place devoted to art and culture. The property belonged to the Gouffier family for around two centuries. It was one of the most famous representatives of this family, Claude Gouffier, Grand Equerry to Francis I and Henry II of France, who commissioned the painted gallery at the château – an exceptional example of the School of Fontainebleau – shortly before 1550. This gallery, one of the largest in France at 55 metres long, features a stunning illustration of the ancient story of Troy. It consists of 14 scenes, apparently produced by a studio in Emilia in Italy (as indicated by a preparatory drawing acquired by the Louvre Museum in April 2008), that reflect the creative spirit that reigned supreme at Oiron during the Renaissance. Claude Gouffier, a noted humanist and connoisseur of contemporary art, also established a collection that included major paintings such as Raphael's Saint John the Baptist and the portrait of John II of France, both now held at the Louvre. Between 1620 and 1642, his grandson Louis commissioned the construction of the Pavillon du Roi, rebuilt the main dwelling and added a number of painted ceilings and décors. Between 1669 and 1683, the Duke of La Feuillade, husband of Charlotte Gouffier, commissioned the work on the Pavillon des Trophées and incorporated the chapel and the Renaissance staircase into the main dwelling. In 1700, the château was purchased by Madame de Montespan on behalf of her son, the Duke of Antin. She divided her time between Oiron and her retreat in Bourbon-l’Archambault, where she died in 1707. The property’s owners between the 18th and 20th centuries lacked the necessary interest, or funds, to manage the upkeep of the château, and it gradually fell into a state of disrepair before being listed as a Historic Monument in 1923. As early as 1840, Prosper Mérimée, General Inspector of Historic Monuments, had noted the poor condition of the frescoes in the Renaissance gallery and indicated the need to preserve this exceptional set of works. The first programme of conservation work (water protection) was commenced in the 50s, and attentions turned to the painted décors in the 70s. The château became the property of the French state in 1941. Alongside considerations about the future of the château and the creation of a collection of contemporary art inspired by Claude Gouffier, a restoration programme was commenced in the late 80s. The restoration continues to this day, with the completion of a seven-year programme of works on the Trojan War and Aeneid sections of the painting gallery. 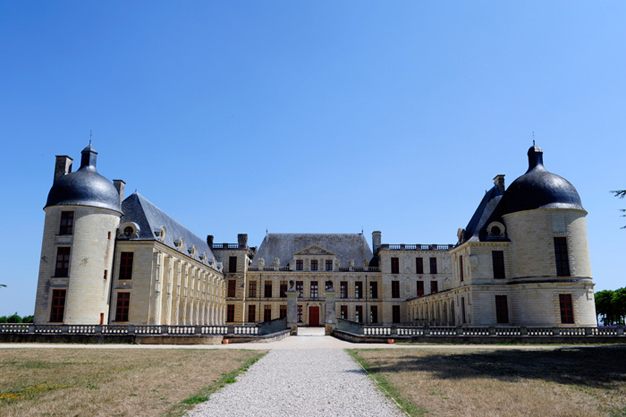 In 1989, the French Ministry of Culture and Communication decided to enrich the château’s historical heritage by establishing a contemporary art collection, inviting international artists to create pieces specifically for the property. The first section of the Curios & Mirabilia collection was officially opened in 1993. It marks the largest ever experiment of its type in France, involving the creation of contemporary works to be housed in an ancient property. In 1996, new works were added to the Curios & Mirabilia collection, marking its completion. The collection is an attempt to rediscover the spirit of curiosity that marked the Renaissance period, drawing inspiration from the ancient concept of curiosity cabinets. The artists were given free rein to interpret this historical reference, creating a firm link with the monument and recreating the feeling of a lived-in property, while honouring the memory of Claude Gouffier’s prestigious collections (16th century). Curios & Mirabilia reflects an entirely different relationship with the world, echoing the importance of the senses to knowledge and understanding during the Renaissance period. Visitors to the historic monument are invited to use all five of their senses – hearing, smell, touch, sight and even taste – to enhance their experience. The smells of Wolfgang Laib’s wax wall, the sounds of Gavin Bryars’ music, the armchairs by John Armleder where visitors can relax, the visual games such as the corridor of illusions (Félice Varini), and the wide variety of other pieces created for the château deliver a visitor experience packed with surprise and amazement. One of the most original features of Curios & Mirabilia is the desire to create a social role for the château, in connection with its human environment. The local population is treated as both a subject of and witness to the creative process, through a portrait gallery featuring images of children from Oiron school (Christian Boltanski), and the annual dinner created by Raoul Marek, for 150 local residents. The dialogue with history can also be seen in the grand halls, where the memory of their historical function has been well preserved. In the Salle du Roi – a place that asserts power and authority – Daniel Spoerri has created an ironic response to the 17th-century princes with body parts that create a new sense of wonder through the reintroduction of daily life and banality into the décor. In the Chambre du Roi (the formal apartments of Louis Gouffier, 17th century) – a symbolic testament to royal authority – the monochromatic paintings of Claude Rutault offer a silent nod to history. In the Galerie des Chevaux, Georg Ettl’s work is inspired by ancient iconography and history. As a result of this collection, the château of Oiron offers a truly authentic experience for visitors – an enterprise that many other historical locations have abandoned. In the 16th century, the château housed Claude Gouffier’s vast collections of art. His personality, and the private nature of the château, added authenticity to this venture. Now that the château is open to the public, the rooms and halls are not only used to present works of art. They have been re-furnished, renovated and updated in a resolutely modern light. The fact that these pieces form a coherent collection further strengthens the sense of belonging to the place itself. At Oiron, the focus is firmly on the relationship between creation and the historical setting, the architecture and the ancient décor.